September 11, 2018 – The Rotary Club of Farimont’s new “Friends and Family” membership option, specifically designed to allow membership to those who participate in service activities, but can’t make the weekly meeting, has given steam to recruiting many new members. The club has added five new members since July 1, with another application under review, and several pending submissions. The momentum from membership has nurtured other areas. The club’s Service, Fundraising and Philanthropic Endeavors Committee has added a target of taking on a new service project each quarter, in addition to the many projects the Club is already involved in. The Membership Committee is pursuing the option of designating the fourth meeting of each month as an evening event, in which potential members and special guests could be invited. Members are finding that evening gatherings tend to be the most enjoyable, and occasionally, the most productive. The club is also testing the use of Facebook Live. President Jeremy Radabaugh is planning to video meetings so members who cannot attend in person can still keep up with club events. Videos of the meeting are posted to the Club’s Facebook page for viewing at any time. 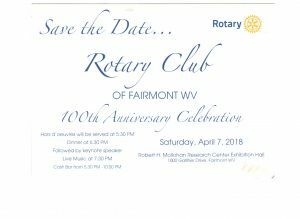 FAIRMONT 2.6.18 – It is with great excitement that the Rotary Club of Fairmont announces it will be hosting the Club’s 100th Anniversary Celebration on April 7, 2018. The event will be held in the luxurious Exhibition Hall of Fairmont’s picturesque-landscaped Robert H. Mollohan Research Center, beginning with hors d’oeuvres and a cash bar at 5:30 p.m.
A great lineup of activities is planned throughout the evening, including various dinner options, awards presentations, a keynote speech presented by a special guest and live big band music and dancing until 10:00 p.m.
With the Club absorbing over half of the event’s expenses involved, a ticket price has been made available for a mere $40.00 per person. Invitations will soon be sent to all of the District’s Clubs and Leaders, and RSVP’s are requested on or before March 10, 2018. Any questions or correspondence about the event in the meantime may be sent to the event’s planning committee chairperson, Sean Sawyer . Hope to see you all there for what is planned to be a fantastic night of fellowship and entertainment!! 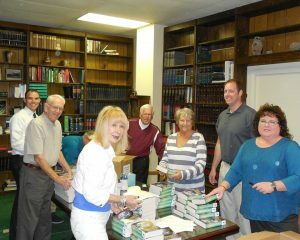 Members of the Rotary Club of Fairmont prepare dictionaries for distribution. Rotary Club of Fairmont recently conducted its annual dictionary project. Each year the club, with assistance from a District Simplified Grant from Rotary District 7530, purchases nearly 800 new dictionaries and distributes them to every third grader in Marion County. Dictionaries are also given to the Marion County Senior Literacy group. These dictionaries contain a great deal of additional information – such as presidential biographies, maps around the world, tables of weights and measures and many other important facts for inquiring minds. This signature project of the Fairmont Rotary Club has been around so long now that every student in Marion County in the third grade or above now has a dictionary provided by Rotary. Club members are very proud of the fact that many of the Rotarians are very involved in the planning, administration, administration and distribution of these dictionaries.